The edge of India (16 days in north east India) | Untamed Borders - Adventure travel.. This trip allows you to experience some of the traditional ways of life of the peoples of the tribal states of north east India. We start this trip in Meghalaya where we will hike down from Cherrapunjee, the wettest place on earth, to the lush jungles on the border of Bangladesh. There we will witness the incredible living bridges of the Khasi people. Then we will take a road trip through the jungles of Arunachal Pradesh and up into the peaks of the Himalayas and the Tawang Valley. We visit the largest Tibetan Buddhist complex outside of Lhasa and experience life in a remote Buddhist convent. To really get a feel of tribal life we will stay at a small Adi village and join some Adi friends of ours on a traditional trip into the jungle. We will see first hand how the jungle is the builder centre and larder for the villagers with rope, poison, baskets, food, entertainment and lodging all available if you just know where and how to look. Finally, we’ll cross the mighty Brahmaputra by ferry before staying a night in a colonial era tea plantation. We will meet you in Guwahati and transfer you to your hotel in Shillong, the capital of the state of Meghalaya. The transfer will take about 4 hours, depending on the traffic. We will have time to have a meal and a short evening walk around the town. 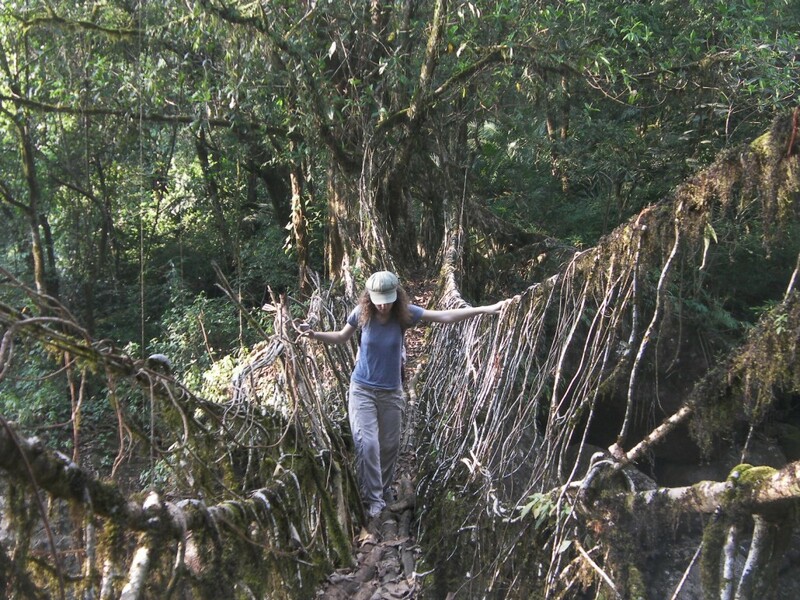 We will spend a day exploring the living tree bridges of Meghalaya. The villages in the valleys leading towards Bangladesh have used the roots and creepers of the Banyan trees to create bridges across the rivers that separate the villages. These living tree bridges are unique and are only beginning to be visited by tourists. We will take a Jeep from Shillong to the top of Nohkalikai waterfall. In doing so we will pass through Cherrapunjee, the wettest place on earth. Although almost all the rain falls during the monsoon in the summer. We will head down a set of steps descending a thousand metres into the valley below. Once there we will be able to marvel at the living bridges that we must traverse to the steps that take us back up. If the weather is good we can take a dip in one of the clear blue pools that we cross. The end of the day is a tough 2000 step climb as we rise out of the valley and then make our way to the Cherrapunjee resort. We will head back to Shillong. In Shillong we will have time to look around the towns bustling bazaar which along with the usual sights and smells of a subcontinental city has some unique items which are brought in by the local tribes people. In the afternoon we will head to the Siat Khnam ground. Siat Khnam is the name of the Meghalaya lottery. However, to obtain the random numbers that people use to bet on in shops all over Shillong they have a novel system. 60 Khasi tribesmen sit in a semi circle around a straw target and fire up to 1500 arrows in the space of five minutes. The arrows are counted and the last two digits of the number of arrows hit are used. If you get the numbers correct then you win. From Shillong we will start our long yet scenic drive to Tawang. The route will see us drive through Assam and across the mighty Bramaputra river. We will overnight at a guesthouse in Nameri National Park. We will take two days to drive from the plains of Assam to the Tawang valley high in the Himalayas. Starting in the jungles surrounding the Kameng valley we will pass through the lands of the Miji and Aka tribes. The road passes many scenic views and waterfalls until we enter the land of the Mompas, Tibetan-Buddhists that arrived in this region centuries before. We will overnight in Bomdilla, a beautiful Tibetan-Mompa town set high on a ridge. The second day will see us enter the alpine beauty of the Himalayas passing over Se La top at 4100m. The scenery changes and yaks, Buddhist gompas and prayer flags ensure that it is a magical ride. Tawang is a huge steep sided valley wedged in between Tibet, Bhutan and the rest of Arunachal Pradesh. It is a remote area and one of the best places to get a glimpse of the Tibetan Buddhist lifestyle which is slowly disappearing from the world. We have a full day in Tawang and will ensure we have plenty of time to visit the Tawang Gompa, the second biggest Tibetan monastery complex in the world and still rarely visited by tourists. In the afternoon we will head to a nearby nunnery to get an insight into religious life in this far flung corner of the world. We will take another two days to drive back from Tawang to the Bramaputra valley. After crossing the Se La, we will overnight in Dirang. A stone built town where we will have time to visit the 500 year old Kalachakra Gompa. From Balakhpong we will drive back down to the humid Bramaputra and follow the river towards the capital of Arunachal Pradesh, Itanagar. It is near here that we will head off the main road to the village of friends of ours where we will spend the night in a local home. Made of bamboo, we will get an insight into Adi tribal life. Each village usually has a number of different religions. Some have been converted to Christianity and we will see a small church but some still keep the old faith of Donya Polo (sun/moon). Donya Polo still permits polygamy and houses will display the skulls and horns of animals sacrificed to the Donya Polo gods to ensure good harvests and prosperous marriages and births. We will stay in a bamboo house on the floor around the fire as guests of the house always do. If you have trouble sleeping then we’ll ensure you get a large serving of Apwa, Arunachali rice beer. We will join a hunting trip with some of the local men into the jungle. They usually spend up to a week in the jungle, looking for boar, deer, monkeys, birds, fish and even small river beetles to bring back and eat or sell at the markets. It will take us one day to hike to the hunting site and one day back. We will provide tents but the tribesmen usually sleep under the stars. On the last day we will return to the village and sleep again in the house of a friend of ours. After a leisurely start and a look around a small tea plantation owned by a Nyishi family, we will take a Jeep and then ferry across the Bramaputra to Dibrugarh. We will stay in a colonial era bungalow for you last night in India. A free morning to either relax in the bungalow or pick up a few final items from the shops in Dibrugarh. A deposit of £250 is required to reserve your place on this trip. If you have any questions regarding this itinerary or about the north east of India in general, please contact us. Or if you are ready to book this trip, please go to the booking form. We do not directly arrange flights and visas. We recommend that you fly to Delhi and use Jetlite to connect to Guwahati and Dibrugarh for the start and end of the trips. Please contact us if you wish further advice on flights and visas. We include breakfast every day. In our experience people sometimes want to eat different things in different places at different times and when there is an option we will be happy for you to have your say. We know some great places and will also happily show you some of our favourite restaurants and tea houses. Some are luxurious, some are more earthy but all have character. When restaurants are unavailable, such as when we are camping in the jungles of Arunachal Pradesh, we ensure that food is provided. We do not and cannot offer a uniform accommodation standard on our itineraries. Even if we wanted to, the reality is that standards in a colonial era tea plantation house cannot be compared to an Adi village. We consider comfort, location, design, character, historical interest and whether the money we spend will go into the pockets of the local community when we make our choices of where to stay. When we choose our vehicles and drivers we take into consideration the road conditions, the length of journey and the competence of the man behind the wheel. The road surfaces in the North East vary from good to atrocious. Most of the roads on this trip are paved although the state of the surface can vary. We will be using Jeeps as transport for the entire trip. Your comfort and enjoyment of the journey is the first priority. The North East of India has a history of armed separatist movements. Whilst activity has been slowly lessening over the years sporadic outbreaks do occur. We monitor the situation closely and we listen very carefully to advice from the Foreign office and from our friends in the areas we visit. Our client’s safety is our primary concern. We must state that the tour leader has the final word with regards to changes in the itinerary for safety reasons. It must be noted that there has never been any incident between these groups and tourists in the past.